Slim Body and attractive figure is desired by all. If you are in good shape, it adds tremendous value to your health as well. Of course, a normal men or women is not after model like looks or physique. They are after having a weight range that is in proportionate to your body frame and height, with appropriate muscle to fat proportion, fit and energetic body. However, the current reality is far from this. My Slim Helps you - the overweight men and women - to shed extra pounds naturally with herbs. Presentation: Box / Bottle of 60 Tablets of 1000 mg Each. Method of Use: Take 3-4 tablets daily. Take 1-2 Tablets after breakfast, and 2 tablets after dinner. Buy My Slim Body to Assist Your Efforts to Lose Weight, in a Faster & Natural Manner! Learn How to Naturally Lose Weight with Herbs & Get 50% Discount for Your First Purchase! Bulge in Belly: Belly is one of the first to put on flab. You can catch hold of belly fat by the side of belly button and it is surely over 1-2 inch or 3-5 cm. It indicates additional fat. Fat to Muscle Proportion: Simple caliper like scales do give an indication. On an average, women have 25-31% body fat (10-13% is essential for ladies). Above 31% is obesity for women. Males do have 18-24% of fat on an average (5-6% is essential for men.). Above 25% fat level is obesity. BMI or Body Mass Index: BMI above 24.9 is also obesity. Weight and Height Chart: These are also helpful. Obesity does more harm to one's body and mind than mere looks. Obesity is one of the significant risk factors for cardiovascular disorders, diabetes and many other lifestyle associated disorders. The good news is that Obesity is manageable and preventable. Generally, if your mildly or even moderately overweight, it is not considered a health problem unless your weight gain is not caused by disorders like Hypothyroidism or other diseases. Even though many diet programs are available and endorsed by many specialists, the importance of metabolism, especially of fat and sugar metabolism, is of supreme importance when you want to control weight with natural and herbal measures. What you are going to read here, can't be found on any other website selling herbs or herbal supplements for weight loss. You are reading about "My Slim Body" and I am trying to point you to 'the true north' of being healthy and getting in desired shape, of which "My Slim Body" is just an important and powerful part. Secondly, even if one of these factors can be controlled by you or are in your favor, the effect of holistic measures coming from more than one of these approaches will always be better. Simply, when you do something about more than one of these factors, you can easily maintain optimal weight and shed off extra pounds. At Holistic Herbalist, the herbs (My Slim Body) do work on metabolism, digestion, detox and colon cleanse. You are provided tools to manage diet while getting nutrition, adopt exercise of your choice or one that suits your body mind type and de-stressing techniques. Maintain a realistic short to mid term goal for weight loss. If you have come here, searching for magical pills for weight loss that you can gulp down and you could emerge as slim and trim in few weeks without changing or modifying your diet and lifestyle, you are at the wrong place. We don't sell hype. Buy My Slim Body to Add Multiple Natural Approaches to Lose Weight Safely! I wish that there could be some switch in body that your gradually twist and you could return to youthful figure in few hours or weeks. I wish that there could be some switch that could be flipped and all your extra body fat could be burned. I wish that there could be some magic herb or supplement for reaching this. I am sorry that nothing of this sort thing actually exists. You body does 3 things to food that you eat or drink. Of course, there are some foods and herbs that influence positively normal physiological metabolism of fat and sugar in your body. And these foods and herbs makes it easier for you to maintain weight and lose extra pounds. Their influence is gradual and natural and is harmless. 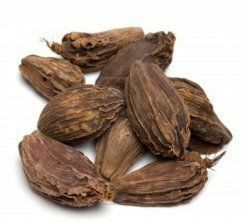 This is what is simply meant by fat burner herbs. Why are you talking about Sugar Metabolism? Fatty and oily food stuff are actually as much culprits for your weight gain as sugar rich drinks and food items and carbs. Your body is able to convert extra 'sugars' and 'carbs' as fat. So natural fat burners are of little use if they are not coupled with sugar metabolism balancing herbs. That is why "My Slim Body" is your ideal and one of the best choice for positively influencing both fat and sugar metabolism. Actually, My Slim Body represents all the safe and effective herbs that can help you to lose undesirable weight naturally. WHAT MY SLIM BODY IS NOT! I have used My Slim Body for few months and got great results. It helped me to shed over 20 pounds in 4 months. 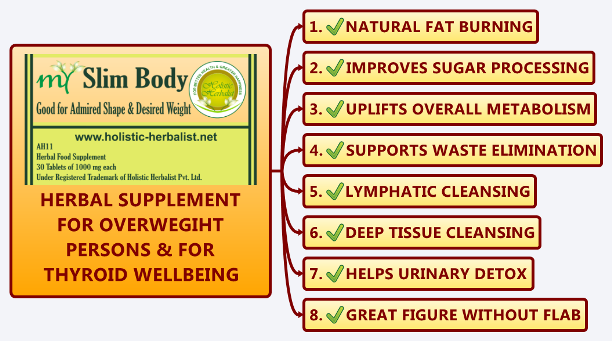 Buy My Slim Body to Let All These Great Herbs Help You to Lose Weight, Naturally! Learn about Natural Remedies About Weight Loss & Receive 50% Discount Coupon for First Purchase! WHAT IS THE PACKAGING OF MY SLIM BODY? My Slim Body comes in two packagings. Bottle or Box. One box or bottle contains 60 Tablets of 1000 mg each. Generally, you can take 4 tablets daily for achieving natural weight loss. These can best be taken like this - 1 tablet after breakfast, 2 tablets after lunch, 2 tablets after dinner or 2 tablets after lunch and 2 tablets after dinner. Persons who are prone to gain weight and who take this for natural weight management can take 2-3 tablets per day like this - 1 tablet after breakfast, 1 tablet after lunch, and 1 tablet after dinner. It has always to be taken with water, and af​ter meals. HOW LONG CAN I TAKE MY SLIM BODY? My Slim Body can be taken for a period of 3-6 months or more. When you are taking it for more than 3 months, give a rest of 3-5 days after every three months. This is advisable for most supplements. WHAT ARE THE OTHER HERBAL SUPPLEMENT THAT I CAN TAKE WITH MY SLIM BODY? It is better to take My Slim Body with Ayur Shodhan. Ayur Shodhan is the herbal supplement for body detox and colon cleanse. You can take 2 tablets of Ayur Shodhan after dinner, with water. CAN I TAKE MY SLIM BODY DURING PREGNANCY OR BREAST FEEDING PERIOD? No, this is against Ayurveda principles to take any herbal supplement for weight loss during pregnancy and breastfeeding. However, you can always prefer to take healthy food with less calories. I have used the three supplements - My Slim Body, My Active Heart and My Joyful Mind - and all with great experience. LET YOUR TRUE SELF SHINE THROUGH, WITH A FIT AND SLIM BODY, EXUDING GREAT PERSONA, ENERGY & HEALTH! Buy My Slim Body to Give Your Body a Chance to Lose Weight Naturally & Stay Fit and Active!